Spicy Tangy: Pizza from scratch ! 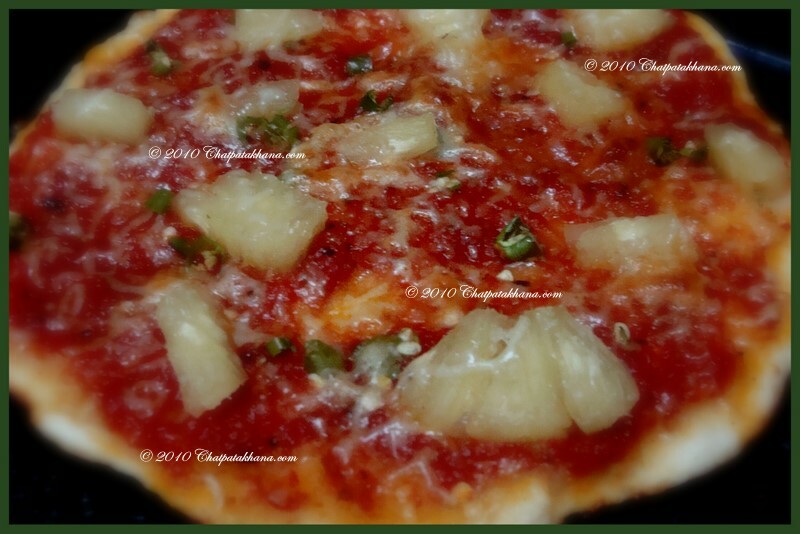 I have used the classic 'pineapple and green chili' combination. 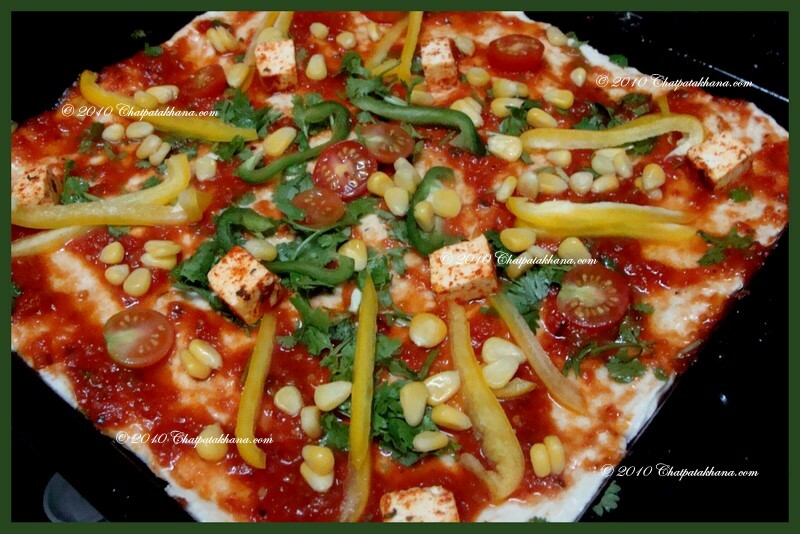 The other pizza I tried was with paneer ( cottage cheese) , cherry tamatoes , corn, capsicum and coriander. Take warm water in a bowl , add yeast , salt and sugar. Mix well and keep it aside for 10 mins ( till it becomes frothy). Sift plain flour in a large bowl, add oil and slowly add the yeast mixture. Incorporate the flour slowly and knead the dough, add little water if required .the dough should be smooth and elastic. Rub oil on all sides of dough and keep it covered in a warm place. Let the dough rest for 1 hour. After 1 hour punch the dough and keep it aside again for 15 mins. Now the dough is ready. Roll the ball size portion of a dough and place it on a lightly floured surface. Roll a thin disk of 6 inch diameter. Prick the base with fork. Place the dough on an oiled baking tray. Gently pull the base towards the edge with your palm and fingertips. Continue doing this till the base is sufficiently thin. Heat oil, add crushed garlic, tomato puree, ketchup, oregano, paprika, salt, pepper and sugar. Cook for 3-4 minutes on medium heat or till oil separates. You should have 2 pizza bases. Spread the pizza sauce on each pizza base, leaving the edges. Put pineapple and green chilli on one of the pizza bases and cottage cheese, cherry tamatoes , corn, capsicum and coriander on the other one. 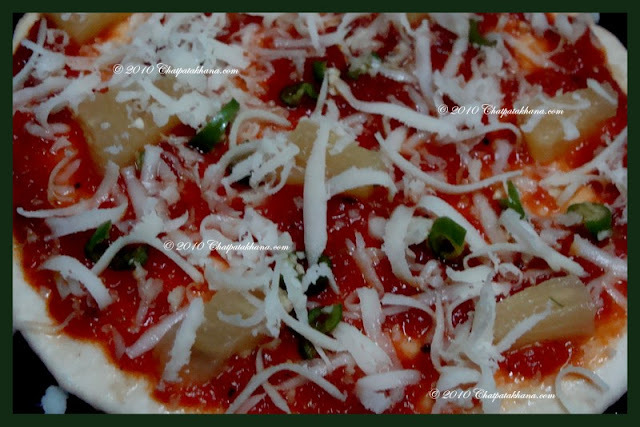 Grease a baking dish and place the pizza. Bake it at 200 C for 10-12 minutes or till the base gets crisp and the cheese melts. You can add any combination of toppings you like. Make sure your yeast mixutre is frothy before adding. Experiment with the shape of the pizza. Kids may especially enjoy different shapes.